If the applicant is young, tell him he's too young, old, too old, fat, too fat. If the applicant then waits for three days without food, water, shelter, or encouragement, he may then enter and begin his training. I am submitting my application for membership in SALTS, the Society for the Appreciation of the Lowly Tinned Sardine. I am standing on the porch. 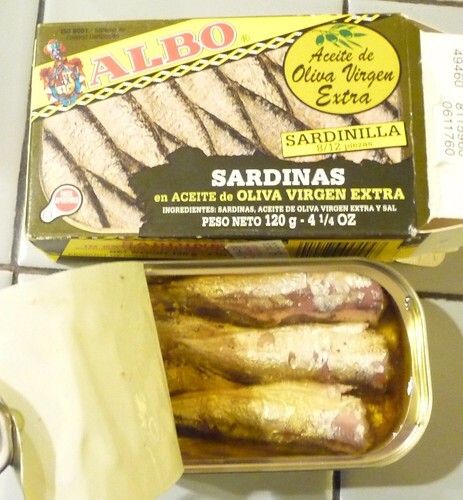 I picked up a can of Albo Sardines, España, at a boutique deli up on College. At just under $6, I thought these are EITHER going to be a great standard by which to judge all others or a huge disappointment. I was there, they were there, I took em home. Eight to Twelve Pieces, more like Eight, and that's OK. This is the most I've ever Payed. While prepping dinner, I ripped em open, and dug in with my tools of the trade. The sardines had a great shape, and the olive oil appeared fresh and clean. The smell was of balance, not too fishy, not too salty. They held together nicely, not mushy. And the taste was great, it wasn't Light of God Beaming Down, but it was really good. Not too boney, not too fishy. Really Good. I gave GG a bite. I still hadn't busted out the saltines or hot sauce or anything. She gave them an Mmmmm, and appreciated the Paco & Lola Albariño going with it. I kept chopping the mise en place, and nibbling out of the can. A few minutes later GG asked for another bite, but it was too late. They were really good. A bit pricey, but if attending a function or looking for a sure thing, I say go for it, but find it somewhere cheaper, four out of five tins. Got two black shirts, two pair black pants, one pair black boots, two pair black socks, one black jacket, $300 personal burial money? Loved the mood on this post!